I’m completely frustrated today. I’ve been on vacation since the end of June, and I have accomplished absolutely nothing. I had all these plans. I was going to write a book, and plan for next year, and start to meditate. 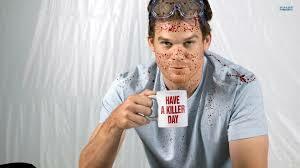 All I’ve been able to accomplish is watching almost 5 seasons of Dexter. I’m completely addicted. Someone, please tell me it’s okay to veg-out and do nothing this summer. I’m feeling guilty.